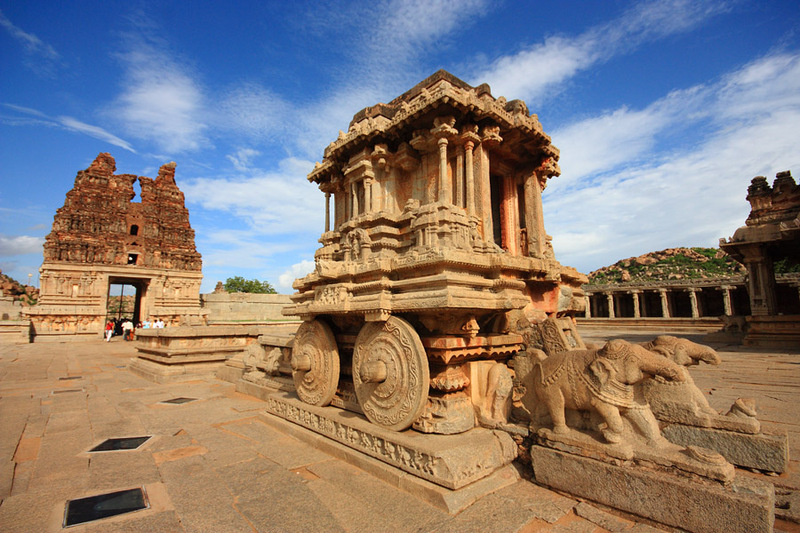 One of the richest empires that ruled the Southern India, the Vijayanagara Empire, had its capital around present day Hampi. What remains today of the once glorious state is the UNESCO world heritage sites, ruins of the empire. Virupaksha temple, Elephant Stables, Lotus Mahal, Vittala Temple, Stone Chariot, the musical pillars and few other monuments amidst the Thungabadra river and the rocky arid terrain give fantastic opportunity for photography. Neelima, one of India’s best travel and landscape photographer, accompanied me and Dilip for a weekend escapade to Hampi. 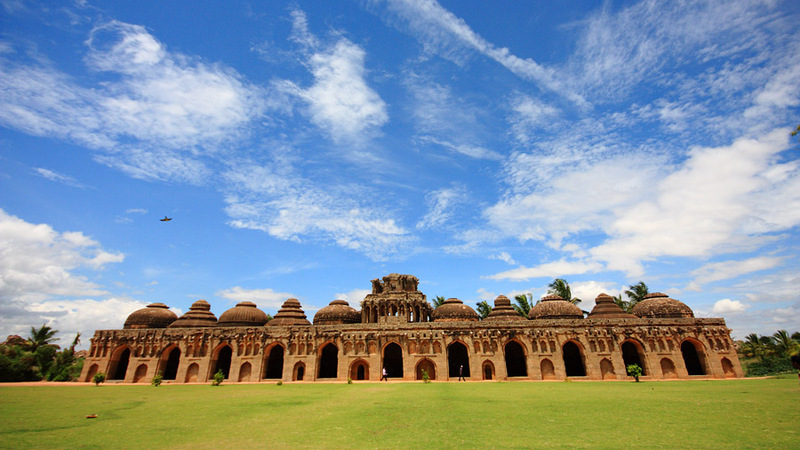 The best option to reach Hampi from Bangalore is through train to Hospet, and taking a cab from Hospet to Hampi. Given Hampi’s popularity and unavailability of train tickets left us with no choice but taking an overnight bus from Bangalore. The bumpy roads for latter part of the journey left me with little sleep and we arrived at 5am. There are many options for accommodation available, on either side of the river Tungabadra. We decided to stay at a shack on ‘the other side’ of the river. This meant taking a boat across the river every time we set out. Each of the historical sites are anywhere between 2 to 10 miles (or ~3 to 15km). 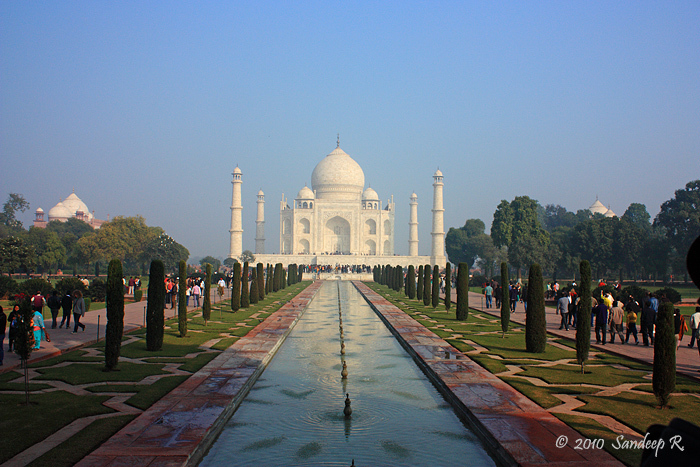 It is possible to visit most of the prominent monuments in 2 days. Hiring a cab, renting a bike or a moped are the different options. We rented a moped. 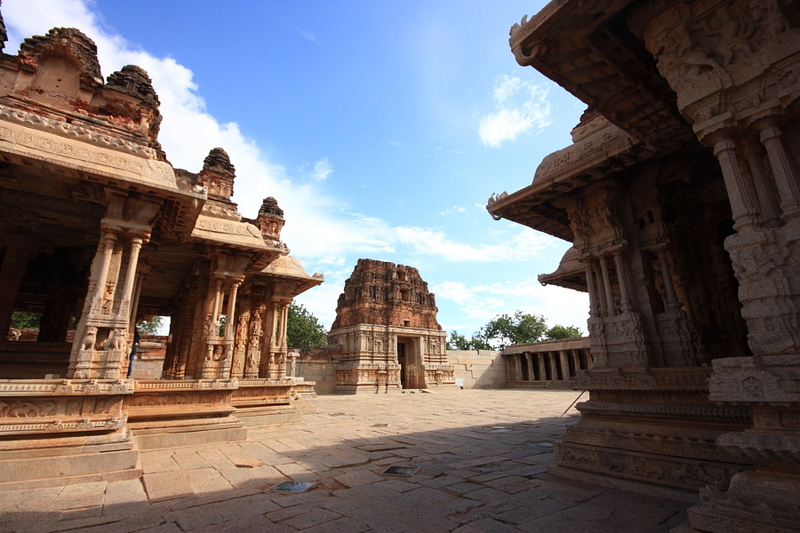 The temple complexes and the rocky landscape provide one the picturesque places for photography. Despite our outing in June, at the end of summer and onset of Monsoon, we were lucky to have splendidly beautiful blue skies. Started out with breakfast at the popular Mango Tree restaurant – cuisine is predominantly western. Our first day stops included Virupaksha temple and few unrecognized ruins at first. Returning to the Mango Tree for lunch. In the evening, we visited the Vittala Temple. This is one of the most interesting monuments at Hampi. I still had the memories of visiting this place decades ago. The stone pillars carved on the mantapa of the temple produces 7 notes of music. It is simply fascinating to see and hear music from gently tapping the stone pillar. However, we were not let to tap the pillars on the main complex. The deterioration caused by millions of tourists visiting had already waned down the thickness of the pillars from what I had seen a decade earlier. There is only one pillar that is allowed for demo. Our guide showed us that and it was equally impressive. Second day plan was to visit the Lotus Mahal and the Elephant stables at the Zenana Enclosure. 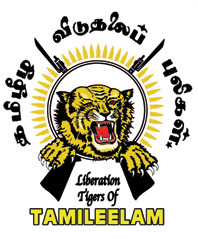 The image you see at the top is the elephant stable. To get the size reference, see the man walking at the center. After lunch, I insisted on visiting Daroji for watching Sloth Bears. We had to ride ~30km. 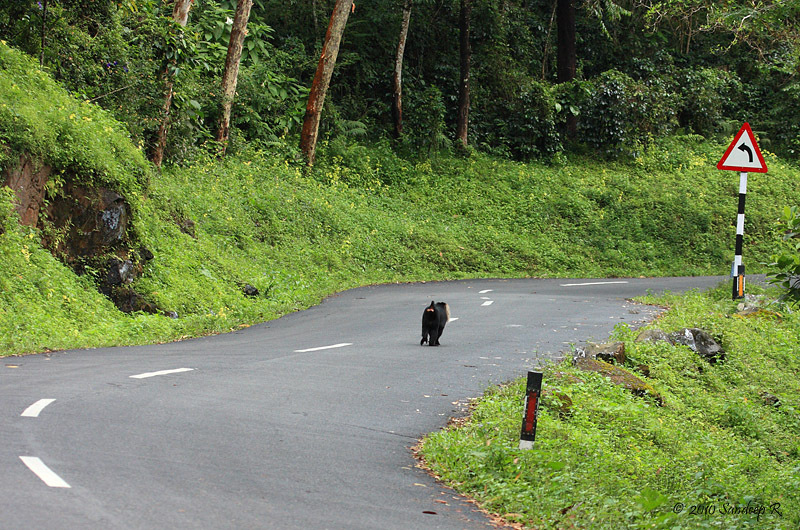 Through the hilly terrain, we reached the Daroji Bear Sanctuary. Birding in the late afternoon was average at best. Sloth bears visit for the jaggery lick on the rocks. We settled at a watch tower at 4pm. However, the bears were not expected until dusk depending on our luck. After waiting for close to an hour and half, we decided to return since we needed to catch the last boat across the river at 6:30pm. I was not fortunate to photograph sloth bears at Daroji and gives me reason to return. 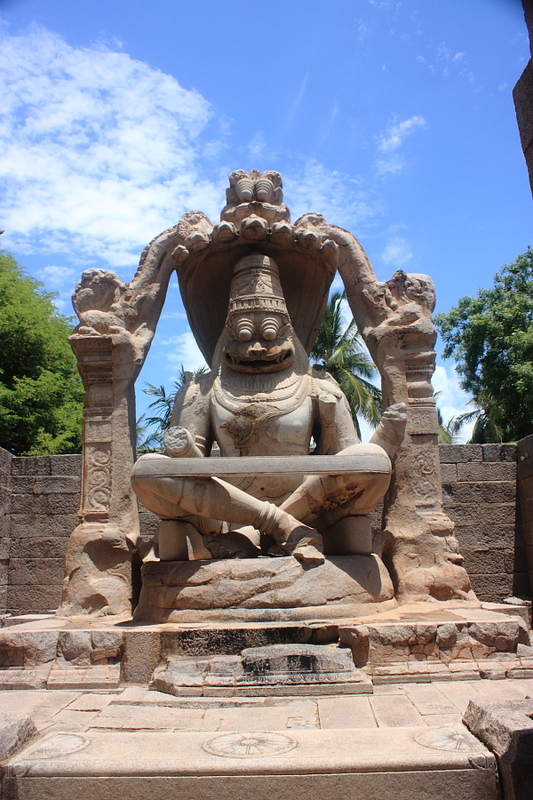 Krishnadevaraya was one of the prominent rulers of Vijayanagara empire. There are legends of gold and diamond ornaments being sold on streets by hawkers during his reign, signifying the wealth during the period. After the Sultans of Bijapur defeated the last emperor of the dynasty, they looted the wealth in the capital and destroyed the hindu temples, monuments and structures. Today, this stands in ruins and as popular destination for travelers. Check out the landscape images from Hampi here. 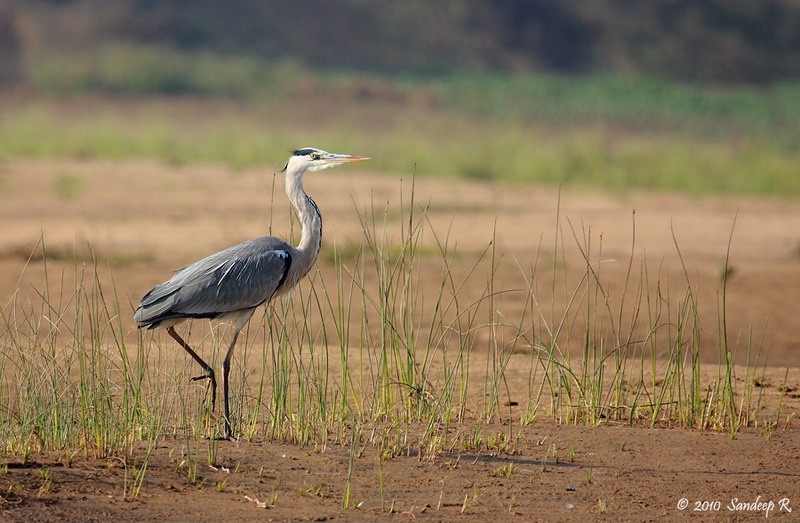 Continuing on the unexpected trip – Read Bharatpur story here. I was disappointed as we were not allowed to get closer to the river bank. Despite the news of heavy rains, the water level wasn’t high. A barricade is set up and a bunch of policemen patrolling the area do not to let anyone closer to the monument from the other side, at least not the tourists. Also, the sun rise was somewhat in front of us. A stupid mistake that I made thinking east was to Taj Mahal’s left but missed the sun’s movement in solar cycle. Anyway it was fantastic to witness the Taj again – from a slightly different perspective than I had viewed more than a decade earlier. After photographing from the rear end garden for an hour, we headed to the main entrance by 10:15am to photograph the Taj Mahal in the typical full frontal way. 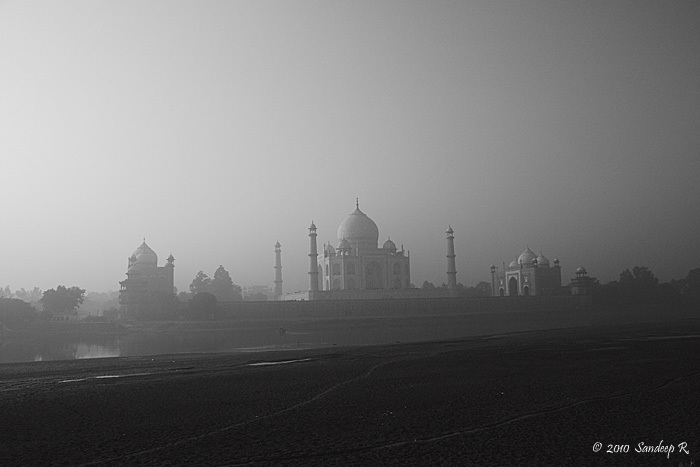 As i jostled the Sunday morning crowed and stood at the entrance with full view of Taj, a foreign lady beside me cried ‘Wow!’. That sums it up. 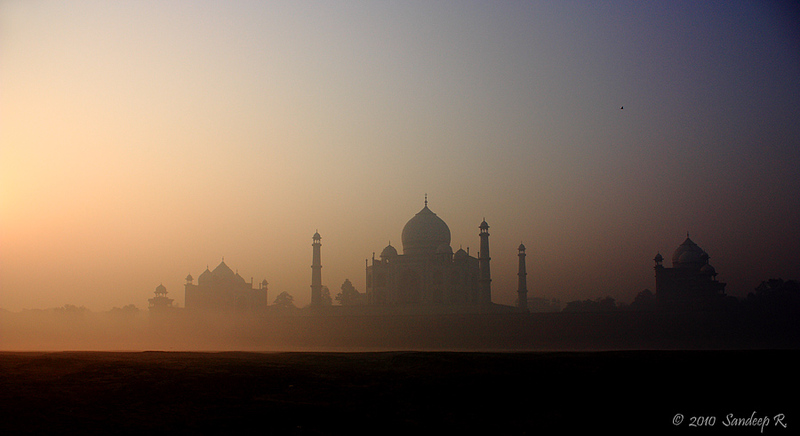 The symbol of love, Taj Mahal, is truly wow. Symbol of love in color looks as beautiful as..
After a late breakfast by 11:45am at a ridiculously expensive restaurant in Agra, we left to Dholpur. The road from Agra to Dholpur is in excellent shape and doesn’t take more than an hour to reach Dholpur. The Chambal Safari boating run by MP tourism is close to the bridge, after Dholpur, on Agra-Gwalior highway. I had talked to a boatman at the place the previous night. Some IAS officer were to arrive on the same day we planned to go, and he warned me that I might not get any boat safari. Since I had only that day to spare, I took the chance and thought of walking along the banks to photograph Skimmers if we can’t take a boat. Talking to Rajeev Tomar was helpful in getting the confidence to take this chance. 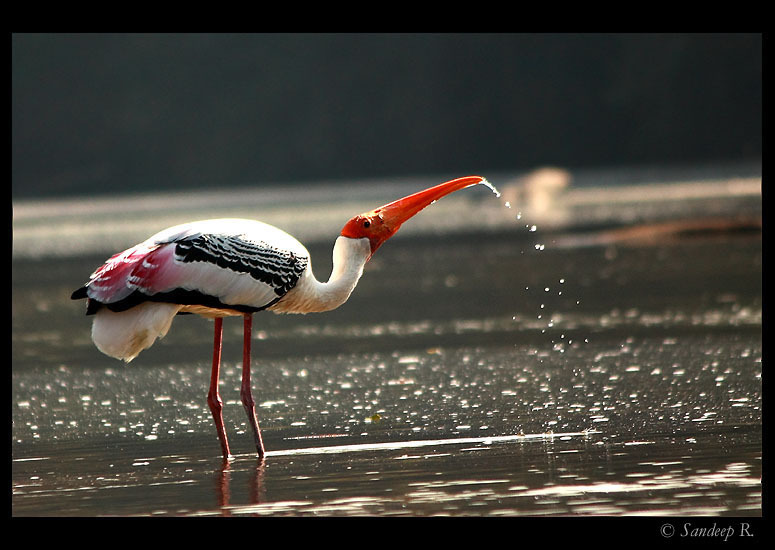 Who knows when I can visit Chambal again! At the boating point, we were told boats are booked for ‘saab’. One of the staff gave me the phone number of the officer who had come with an entourage that would take all the 5 boats. Thankfully, on my request, that person agreed to let us take a boat for couple of hours. What an incredible 2 hours of boating it was! The two hours of boating from 1:30pm to 3:30pm on the Chambal river gave me the sight of a variety of Birds, mammals and reptiles – Skimmers, River Lapwings, Black Bellied Tern, Bar headed Geese, Ruddy Shelduck, Comb Duck, Black Winged Stilts, Gharials, Muggers, Turtles, Gangetic Dolphins and more! Though I could only manage few glimpses of endangered Gangetic Dolphin, I could get photographs of many of the avian and reptilian species in the fantastic riverine habitat. Next, the reptilians. Chambal river is home to the reptiles mugger crocodiles, a variety of turtles and the critically endangered Indian Gharials. Chambal river is without doubt the best place to sight the Gharials. 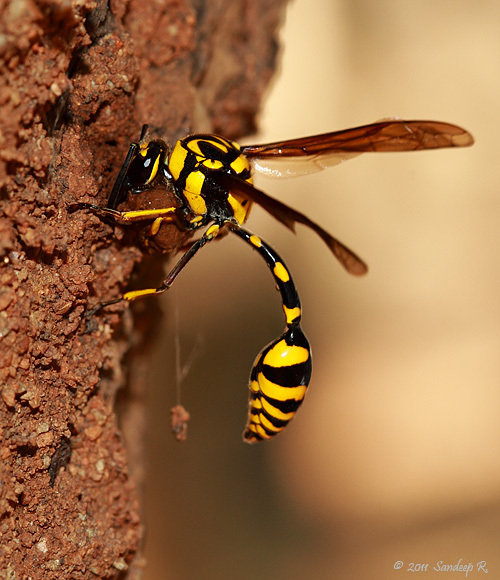 Their population was in such bad state that they were in the verge of extinction. 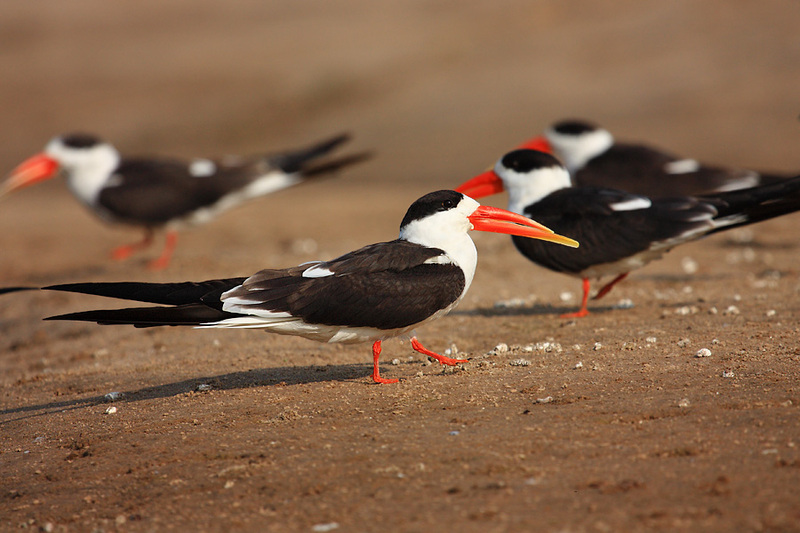 Thanks to the efforts of conservation organizations, they are making a strong come back. 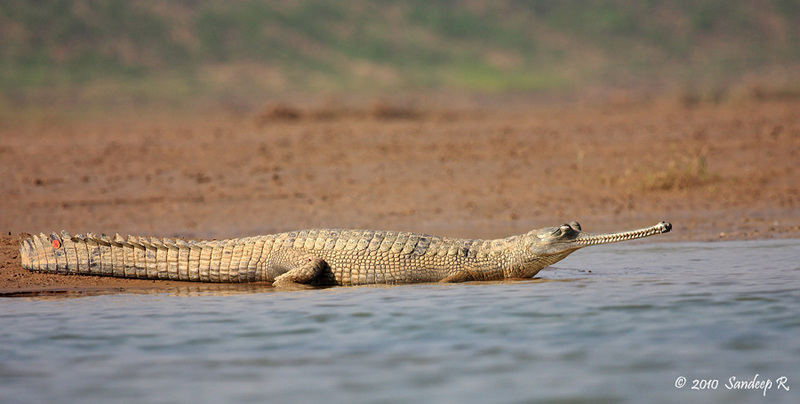 One can easily sight a gharial swim and bask around the Chambal river now. By the time we returned from the boating, Rajeev had arrived at the place. He then took us to Gharial Rearing Centre. Illegal fishing, inadvertent destruction of breeding sites and habitat destruction are major threat for their survival. 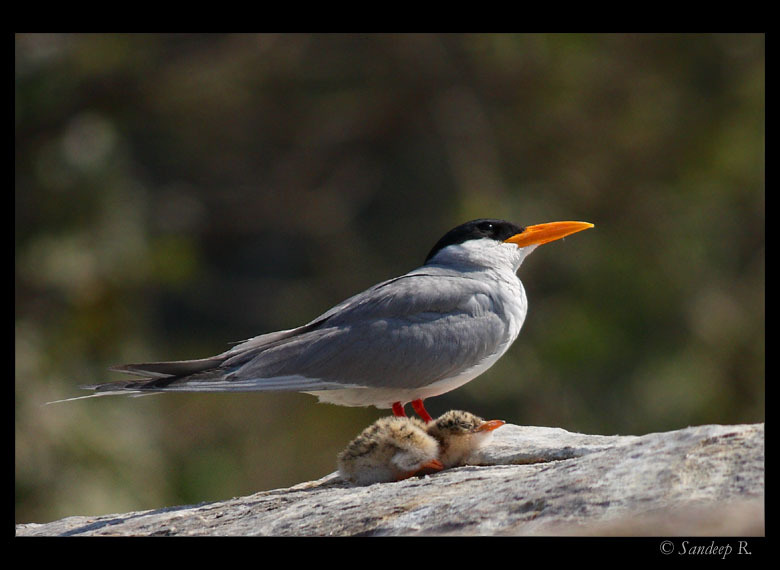 From the banks of Chambal the rearing center collects eggs, and hatches them in incubation. The young gharials are fed with fish and taken care till they are about 6 months old, when they are let into the wild. 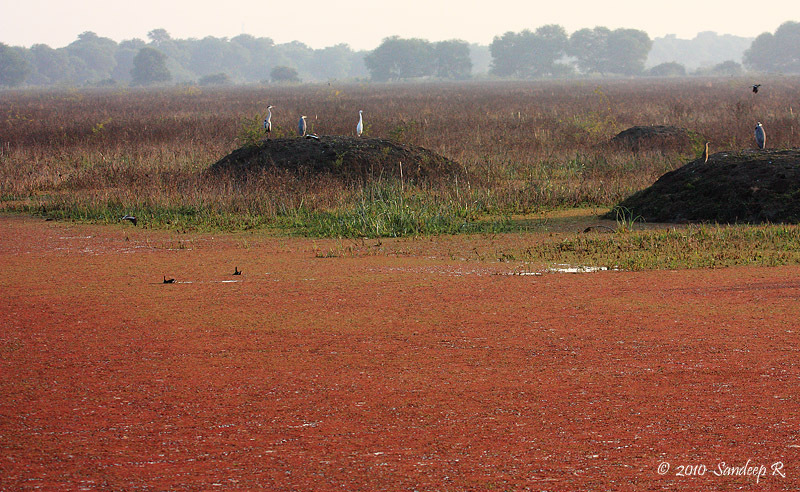 Most of the Gharials you see on the Chambal river are from this rearing center. I was lucky to hold a young Gharial. Though they look naive, their razor sharp teeth can make enough damage. 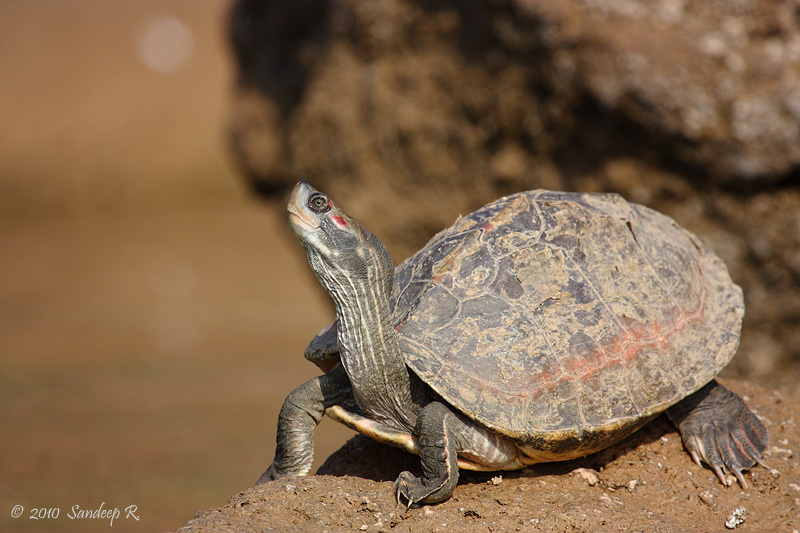 We also saw young Indian tented turtles at the rearing center, and a huge adult basking in the sun on the river while on boating safari. 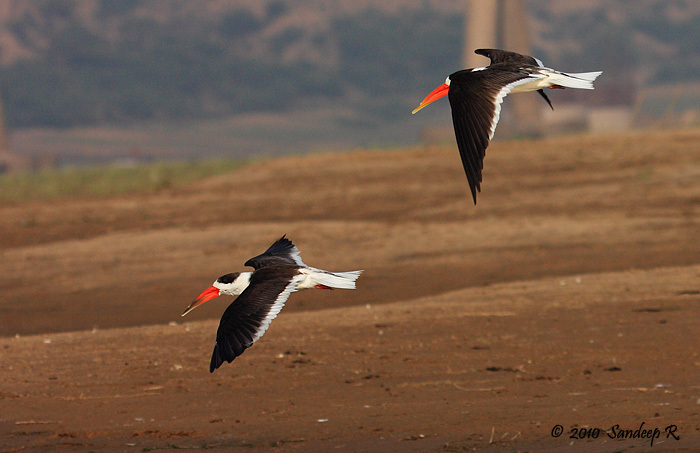 And then there were Skimmers – the target species for my trip to Chambal. Initially we saw a pair skim momentarily and fly away. 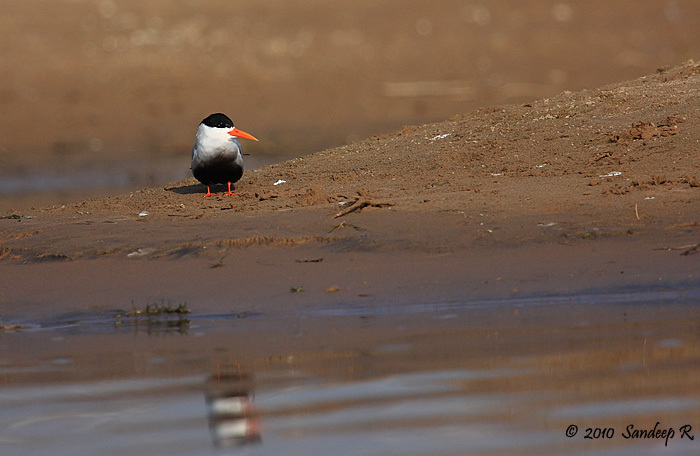 Soon, we saw over 30 skimmers on the banks. They were in no mood for fishing and were roosting on the banks. 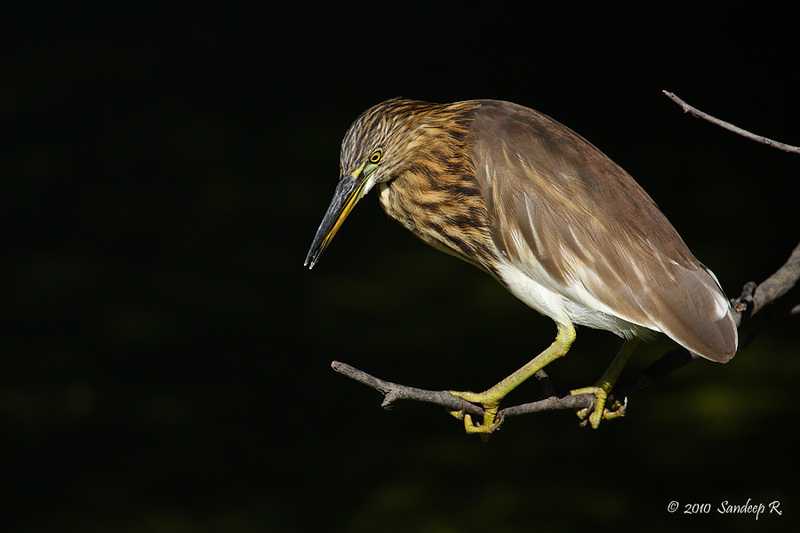 They get their name because of the style of their fishing – the bird flies just above the water skimming the water surface to grab any fish if it comes in the path. Check this image of Mario Goren to see how they fish. 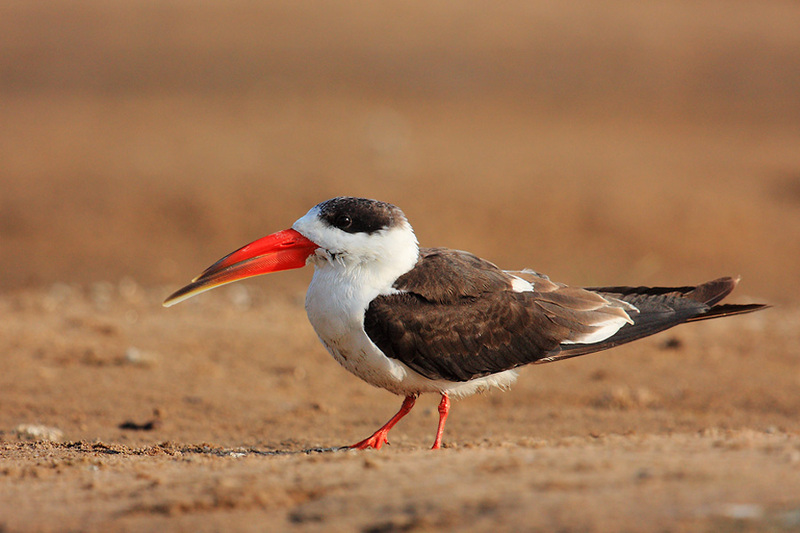 Indian Skimmer flock – it was difficult to get a portrait of single bird with so many around, until..
Later in the evening, after a round of chai at Rajeev’s house, we were back at Taj to do some night photography. Lest I knew that there were street lights put at the foot of Taj, even on its rear side, I’d not have made the futile effort of going there. 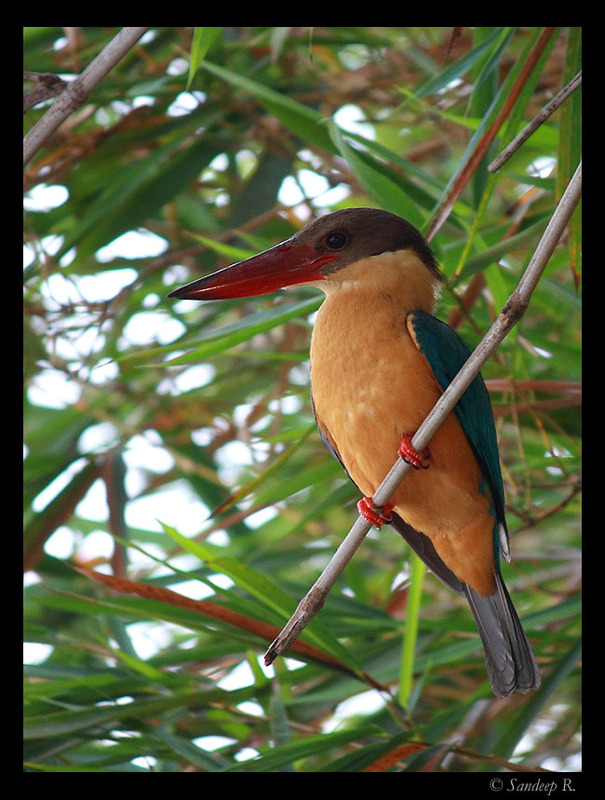 Later that night, returned to Bharatpur – and next day, from there to Delhi and then to Bangalore. I would like to thank and dedicate these photographs to Rajeev Tomar for giving me confidence on making the short trip despite the boatman suggested me otherwise. It was the most enjoyable and productive two hours of photography. Also, thanks to Rajeev for taking me to the Gharial rearing center, which I had no idea about until I went there. Distance: 180km; Driving time: About 4 hours. 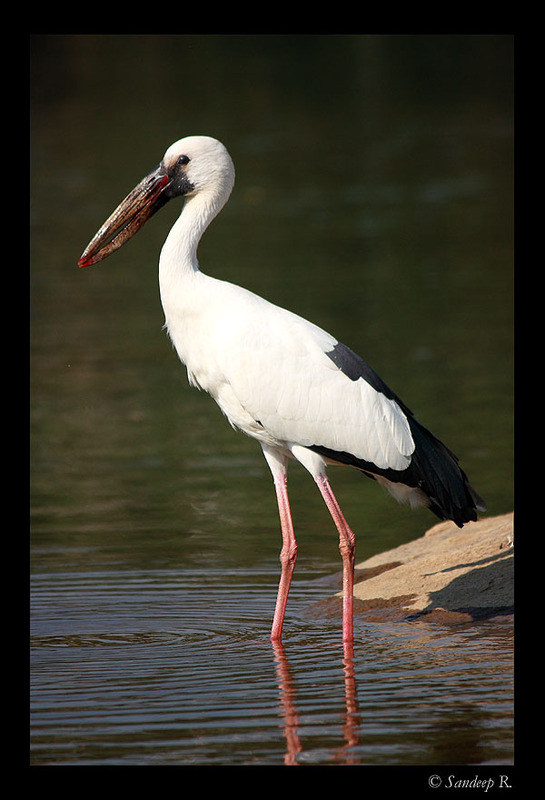 We reached Bharatpur by around 3pm and drove straight to Keoladeo Ghana National Park. Thanks to Arun Bhat, I had contact of a good guide. 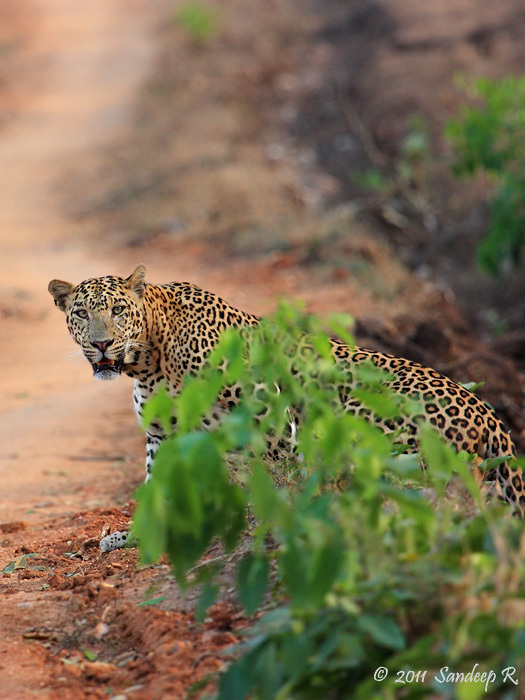 Had contacted Captain Singh for guiding and he was on the park entrance waiting for us with a spotting scope. He showed a Collared Scops Owl right on a tree right at the entrance. Hired a rickshaw and briefed Kaptaan what we expected to see. Were looking out for Dusky eagle owl, but first up, sighted a Grey Nightjar. 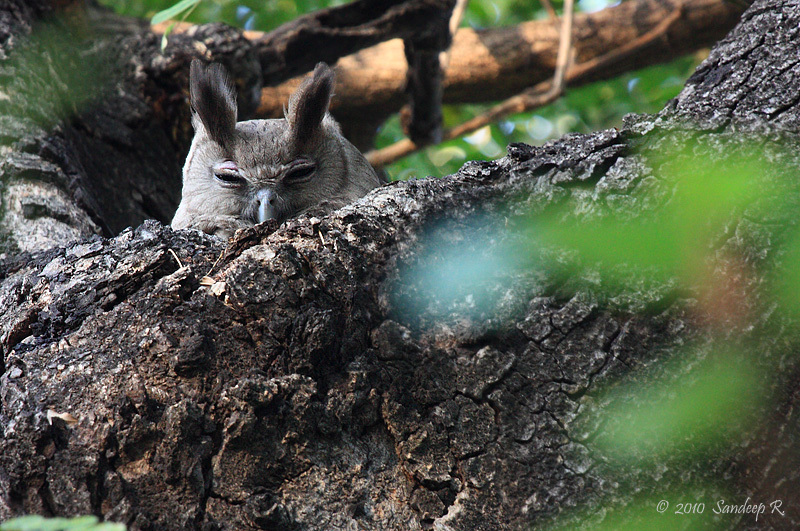 Soon located a resident Dusky Eagle Owl. She was tucked away in her roosting spot. What a beginning! Two fantastic lifers. 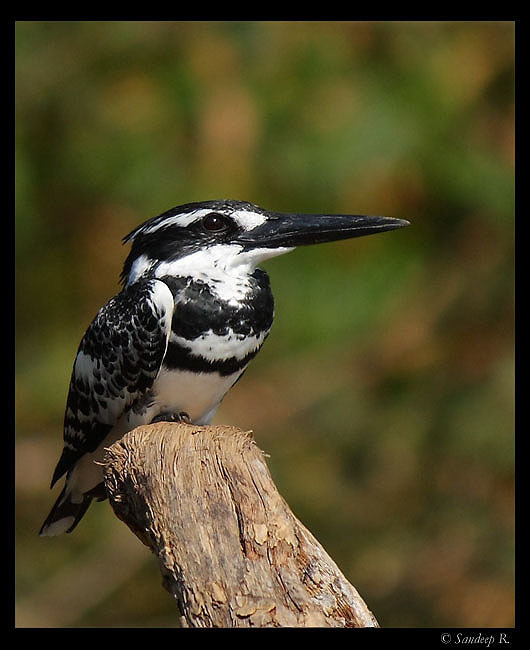 As we moved on our way, sighted a Golden Jackal and many Herons, Painted Storks, and Cormorants. Photographed a Painted Stork fishing, had a glimpse of Bluethroat and watched the popular small blue kingfisher dive a few times. 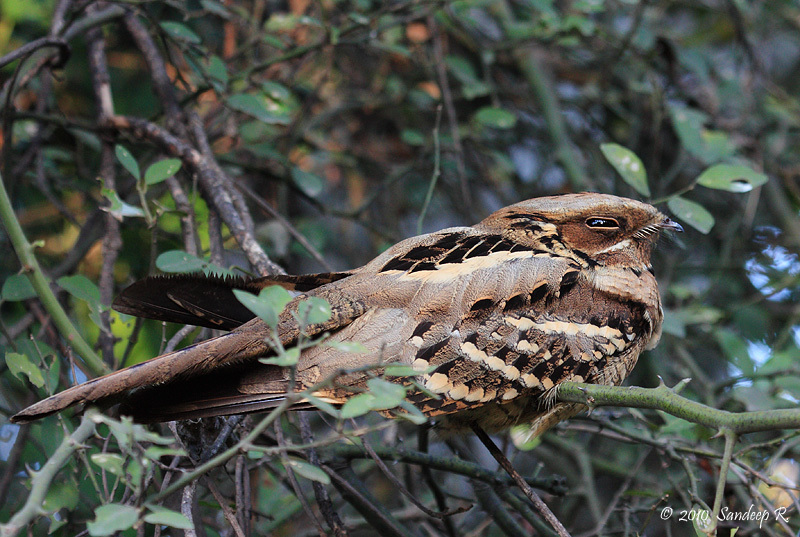 Long tailed nightjar was on my list and were lucky to sight it. The habitat at Keoladeo Park is breathtaking. One can only wonder how fantastic it would have been in it’s pinnacle! Later, Moved towards the temple of Keoladevi. 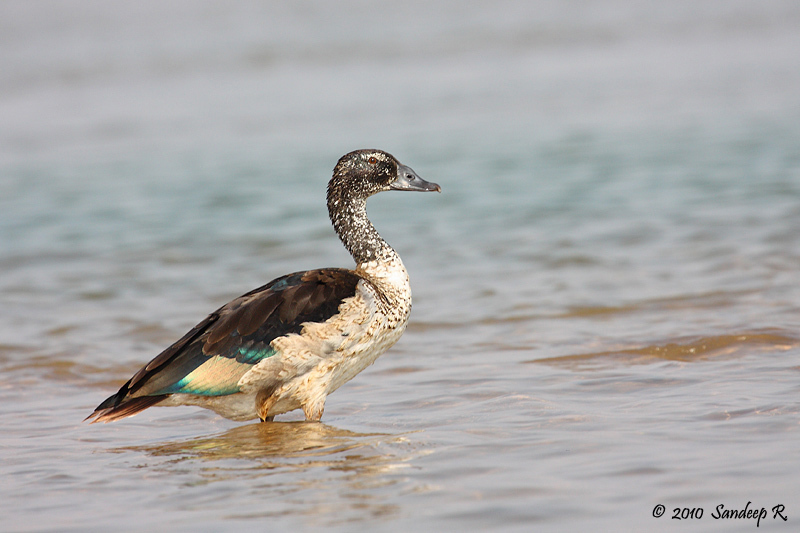 We were watching hundreds of ducks – Comb duck, Ruddy Shelducks, Pintails and few others. 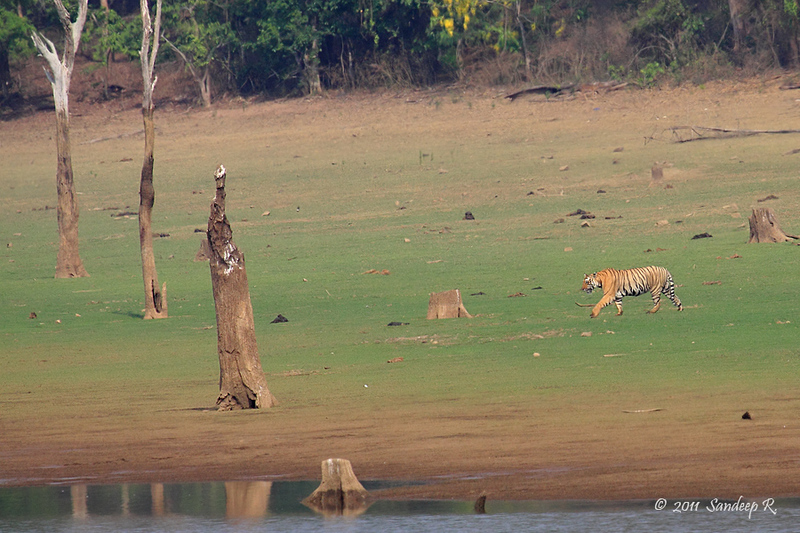 It was not a good opportunity for photography as they were far away for any decent shot. 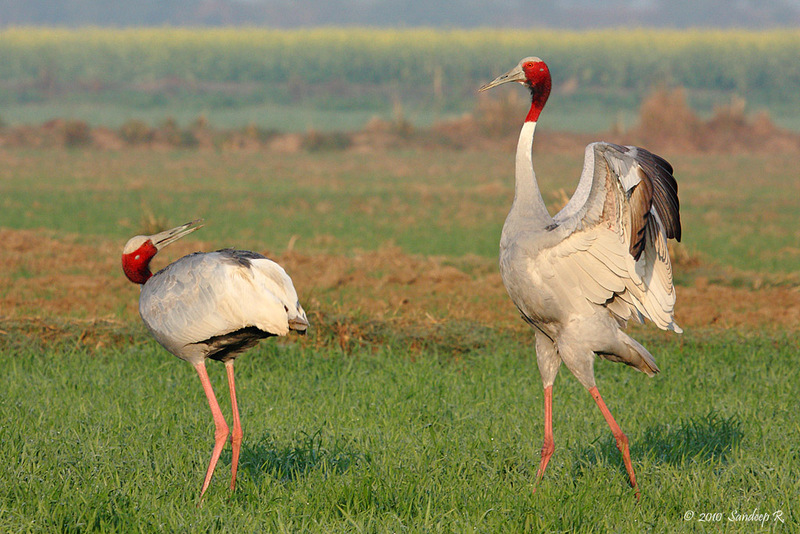 A lone pair of Saras Cranes were on the far end of the once glorious wetland. Just then our rickshawala called out that he sighted a Black Bittern. We ran towards the spot. From far, had a good look. Just as we inched closer, the bird flew and hid in the reeds. By then dusk was setting in, and we started back. 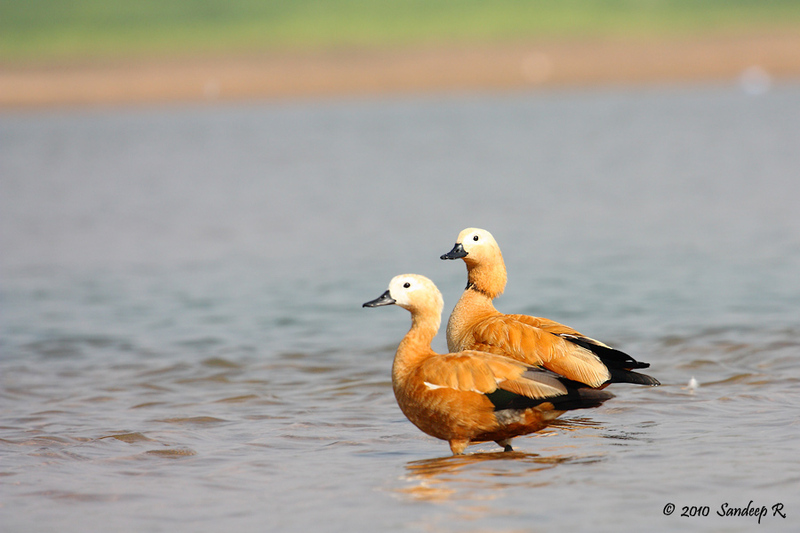 Photographed a pair of roosting Ruddy Shelduck at the evening on the way back, while chalked out the plan for next two travel-crazy days as we got out of the park. Checked into RTDC Saras – a reasonable priced cozy place to stay at about 500 meters from the entrance to Keoladeo Park. 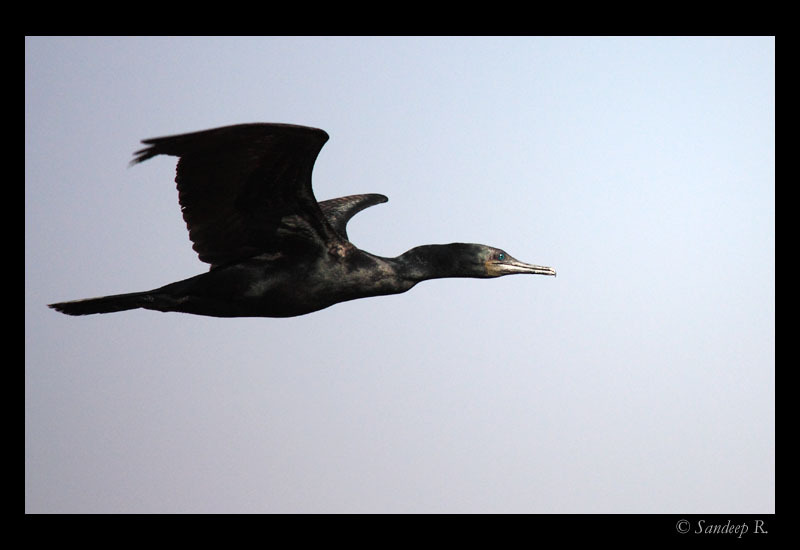 The next day was spent in Agra photographing Taj, and few birds at Dholpur side of Chambal river. Returned to Bharatpur for overnight stay. On Monday morning, the target species were Saras Crane, Black Necked Stork, Siberian Rubythroat, Oriental Scops Owl, Painted Snipe and Little Green heron. First up, Captain to us to a place outside the park where Saras Cranes are expected to be seen. After nearly an hour of driving back and forth, we had not sighted Saras Cranes, but a few Grey francolins, and 3 Egyptian Vultures. I was getting edgy and wanted to get back to the Park. Maybe we’ll get them there. As we were driving back, I was deleting few images to make space in memory card, Kaptaan said ‘Saras Crane‘. Excitedly, we got out and slowly approached a pair that were feeding in the fields. We made images as we approached, slowly and carefully. The lighting was just perfect – brimming early morning sun behind our back and minimal mist. I was content with images I could capture. I got closer and closer to get a portrait. 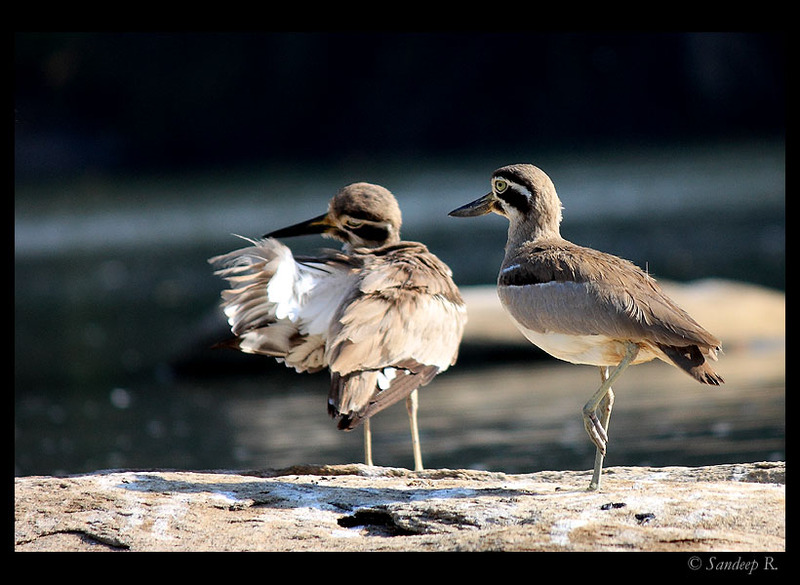 Just then, the pair started their courtship dance and song. 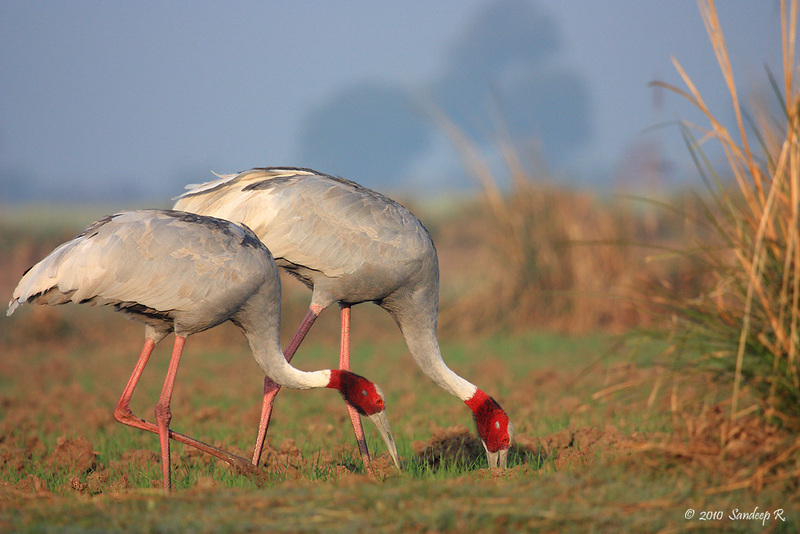 Saras cranes mate for life and they share an incredible bond with each other. It was the most incredible romance to see. I fired as many shots as I can. 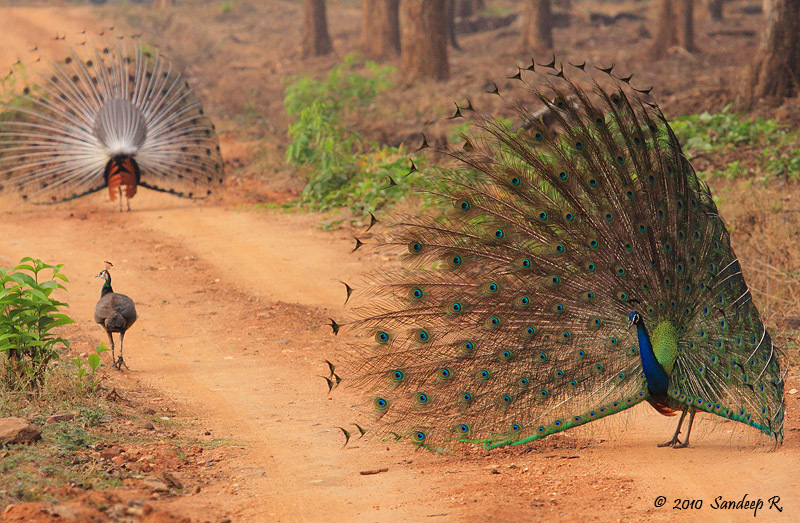 The courtship ritual ended in both the birds getting close to each other, singing and looking up into the sky. Just as they ended the sequence, I fired a shot and my camera displayed ‘memory card full’. My mind read, memories forever. 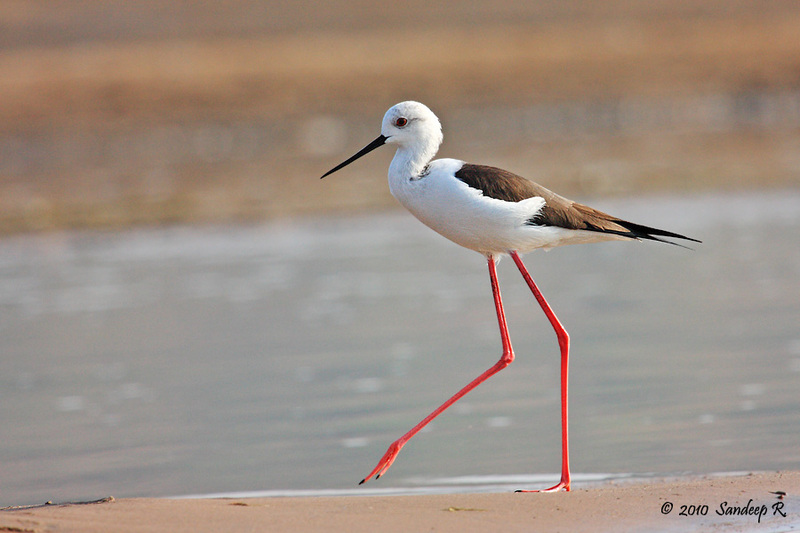 Back at the Keoladeo park, we headed straight into the first check post in the car – I was running short of time as I had a flight to catch from Delhi that evening. 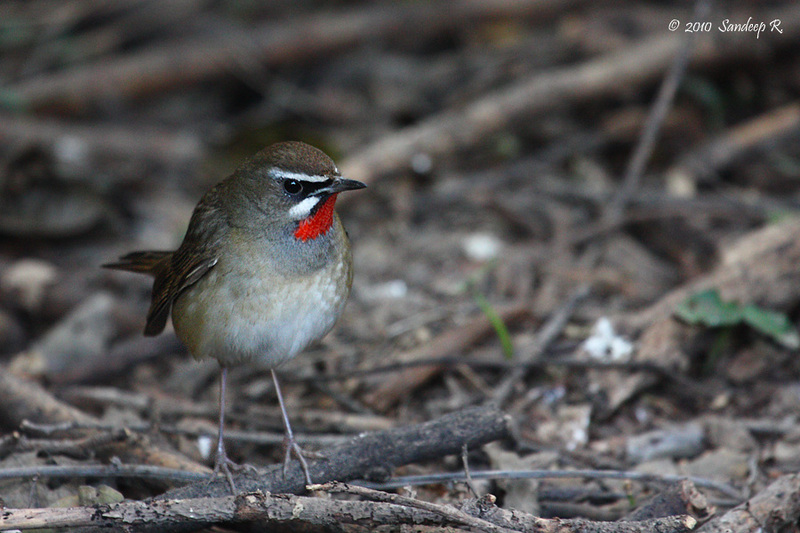 Started looking for Siberian Rubythroat. After 15-20min of patient motionless-noiseless waiting, male of the tiny bird made a few brief appearances in the undergrowth. I could clearly see the ‘ruby’throat. Spent another 10min waiting and captured an image I was happy with. Then, hired a rickshaw there and spent the next two hours looking for Little Green Heron and Oriental Scoops owl, without much luck. But we did see a Black necked stork pair. Also sighted a Greater Spotted Eagle. While getting back, tired to get male of Dusky Eagle Owl but without success. By about 11:30am, left the park to check for Greater Painted Snipe in the nalas of Bharatpur. We did see the bird, but wasn’t a good photo opportunity. It was getting late and had to leave the place. We left for Delhi by 1pm, and headed straight to airport. Reached Bangalore home at 11:55pm, ending a power-packed, short, unexpected but memorable trip. I spent only 2 hours in the evening on first day and 4 hours in the morning on the last day. Yet, I could see a variety of species. Despite being in a great hurry, I could manage few decent photographs. If you spend 2 days, you can make a plethora good of images. 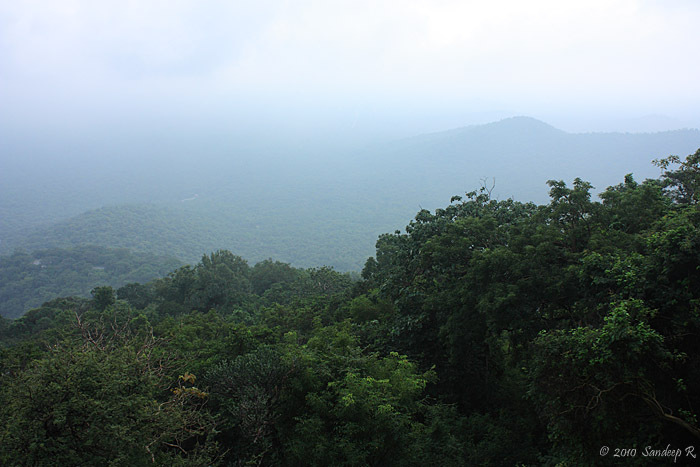 Valparai, a little known town of tea estates with scattered wildlife, was on my mind for long time. Had missed out couple of times after a good planning, but not this time. After a month of planning and consulting with Kalyan, Selva, Shiva, and Raju, I chalked out a plan to spend 2 days at Valparai and 2 days at Topslip on a 5 day trip, driving both ways. One hitch was, accommodation at Topslip forest department was not confirmed even after sending out a letter to DCF a couple of weeks in advance. Vinay, Arun and I set out from Bangalore by 7am on a Fiat Punto, which took a lot of brunt on the whole tour. Target species for the trip: Lion Tailed Macaque, Nilgiri Tahr, Great Hornbills, Waynaad Laughingthrush, and Oriental Bay Owl. The toll road is in impeccable shape, and you can easily cruise at 150kmph. Stopped over at A2B for breakfast and reached Avinashi with few brief stops by around noon for lunch. Lost a lot of time around Avinashi in asking for directions and chaotic traffic. We had to confirm booking at Pollachi DCF office and spent some time in locating that place in Pollachi. By around 3pm, we set towards Valparai. What a fantastic drive that was! The view of Aliyar dam from the escalating 40 hair pin bends is simply breathtaking. The roads are in brilliant condition despite the perpetual rains and traffic. Enjoyed a cup of tea adjacent to the tea gardens half way into the ascent. Didn’t find the Tahrs around the hairpin bends, but enjoyed every bit of the drive. Reached Valparai close to 5pm, checked into our home stay and set out for a drive around the town in on a cloudy and drizzling evening. While returning to homestay that night, Vinay parked the car into the underground stairway of the home stay. And no, he wasn’t drunk. Just the darkness and drizzling rain did him in. What an adventure it was to get the car out of the ditch! Phew!! Fortunately nothing more than minor superficial damage to the car. The next morning, weather was still gloomy and looked like it’d pour any moment. 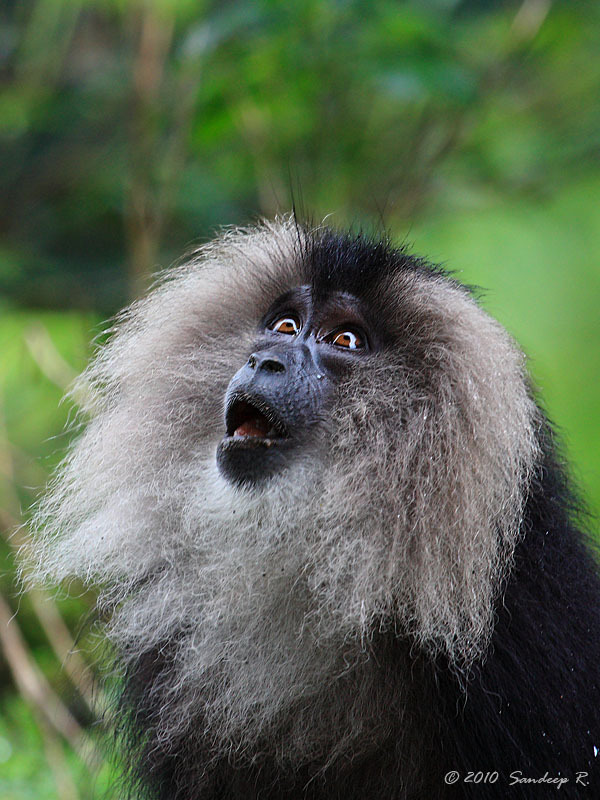 Poothotam was the place to find Lion Tailed Macaques, and we set out early. Too early in fact for LTMs. So we drove around Paralai and Varathaparai and enjoyed the landscape bristled with rain forests amidst vast tea estates. 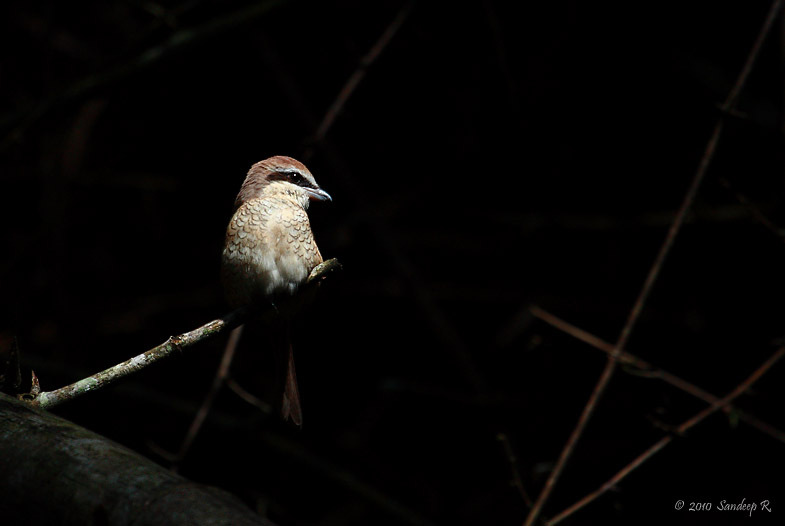 A barking deer around Monica estate bungalow, and scimitar babbler were the highlights. Listening to the song of Malabar whistling thrush was the most delightful experience. After a quick breakfast, we again set out towards Poothotam estates. We saw a pair of Malabar Grey Hornbills. Around the directors bungalow, sighted a lone Forest wagtail. I was super thrilled. Vinay was getting edgy to see LTMs. Walked around to sight more birds, but got too many leeches instead. No LTMs yet. As I was driving out of the estate, saw a bunch of macaques on ground on far right. Jammed the brakes and cried ‘LTMs’. Spent the next couple of hours photographing them. 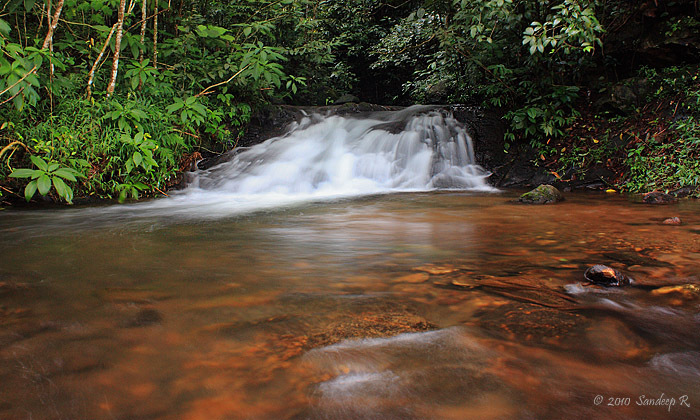 I then spent some time photographing the small waterfall and stream opposite to Poothotam estate. The light was dull and we left for lunch. Post lunch, we lazed around for a while and charged the camera batteries. By around 3pm, we set out to look for Great Hornbills. We were told morning or early afternoon was the better time to sight these magnificent birds, we nevertheless wanted to try out luck. After a lot of scan and search in the pouring rain, we did find a couple of great hornbills on a fruiting tree. It was good sight but not the right conditions to photograph. We moved towards Sholayar Dam. 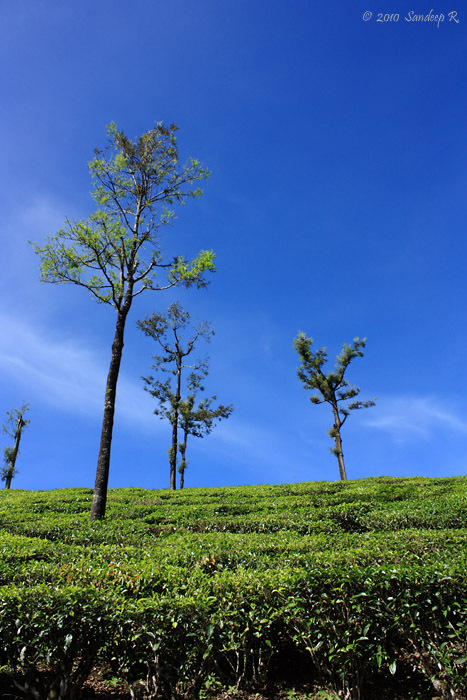 The tea estates on the backwaters of the dam are ideal locations for good landscape images, if weather permits. The best part of the evening was the drive on the narrow roads in pouring rain. 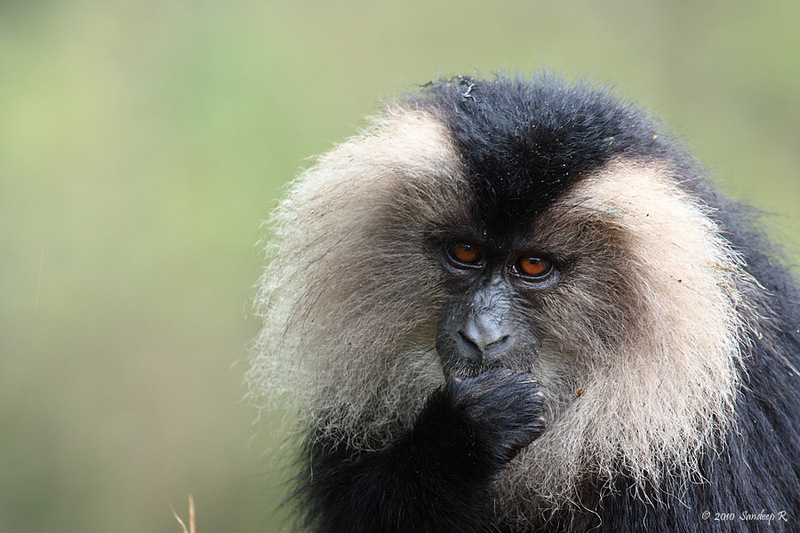 Fragmented habitat and habitat destruction are the biggest challenges for the few thousand surviving Lion Tailed Macaques, found only in small patches of rainforests of Western Ghats. The alpha male of a troop was looking for his members when a truck almost ran over him. 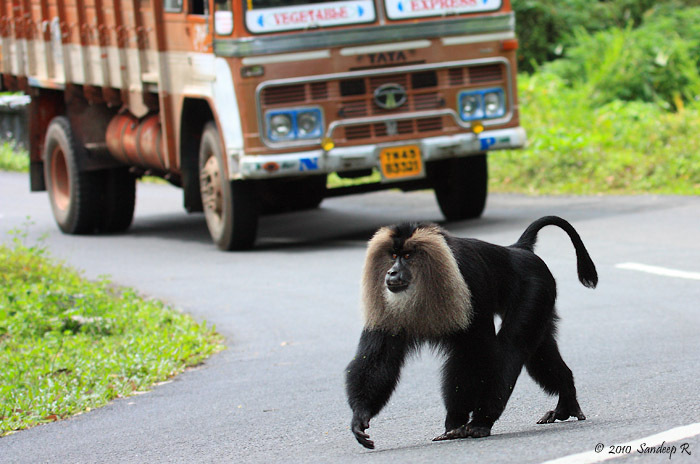 It not not uncommon to see road kills at Valparai – Check Kalyan’s image of a road kill here and here. Despite two guards instilled by NCF and 3 of us photographing, the truck didn’t bother to slow down or watch out for the macaque. On Monday morning, we were to leave to Topslip. It had rained all through the night and the morning was crystal clear with blue skies dotted with few white clouds. This was the ideal weather we wished for. But had to drive to Topslip, a good 3 to 4 hours from Valparai. We didn’t want to miss the accommodation at Topslip. But we scanned the area for Hornbills for a couple of hours, but no luck. 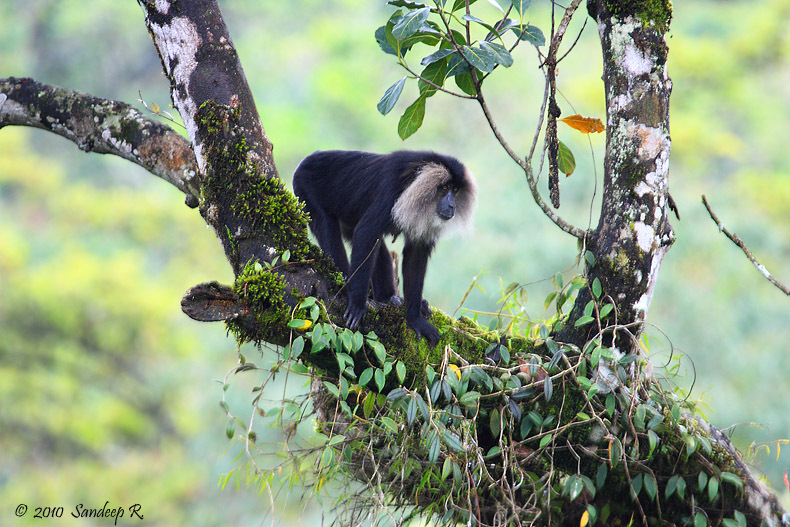 The acrobatics of Nilgiri Langurs were a treat to watch. Malabar giant squirrels and Nilgiri Langurs were in plenty. By 10am, we headed towards Topslip, with a couple of confirmation calls to Pollachi Forest Dept along the way. We did get a room we wanted at Ambuli Illam – about 3km inside the forest from Topslip reception. Soon, it started to rain and we didn’t see the point of trekking that time. So we just drove in car, in case we sight something, but no luck. Back at the reception at 4:30pm, few people were waiting to visit Elephant Camp. 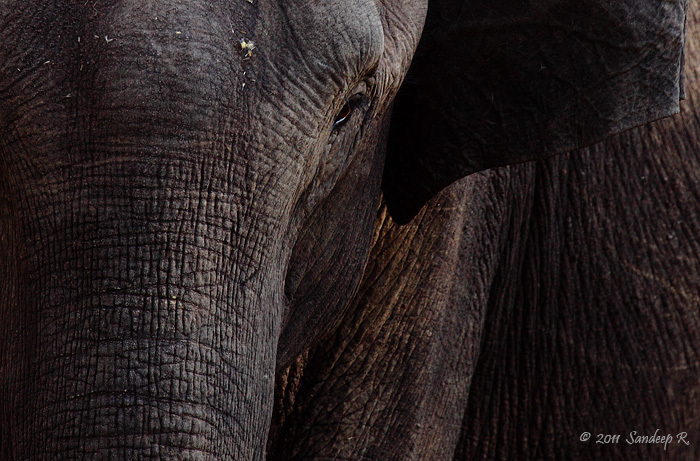 We joined them and went to the elephant feeding camp which had about 8-10 elephants. Got back to our rooms for a early dinner and dozed off soon. Next morning, the rain gods had taken a break. On way from Ambuli Illam to Reception, we saw a flock of Wynaad Laughingthrush. It was very misty and no decent photographs, but what a sighting it was! 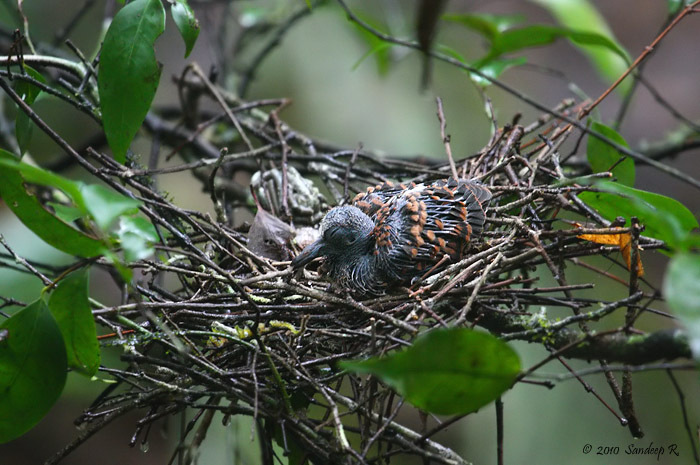 Trek to Karian Shola, a hotspot for variety of endemic birds, was the morning’s plan. I wanted to take a good guide and had made arrangements for the same. Unfortunately, to my disbelief, the Ranger didn’t allow us to take the guide we wanted since he was not from the forest department. He didn’t even budge to let us take him as a visitor! We were put to a forest department employee who knew very little about birds. We were obviously disappointed, but didn’t have much choice. An hour into the trek, we hadn’t seen anything other than a flameback and an emerald dove. We had paid 1000 bucks for 4hour trek, but didn’t want to continue if the guide didn’t even have an idea where to look for birds. We asked him to get us back to Reception. 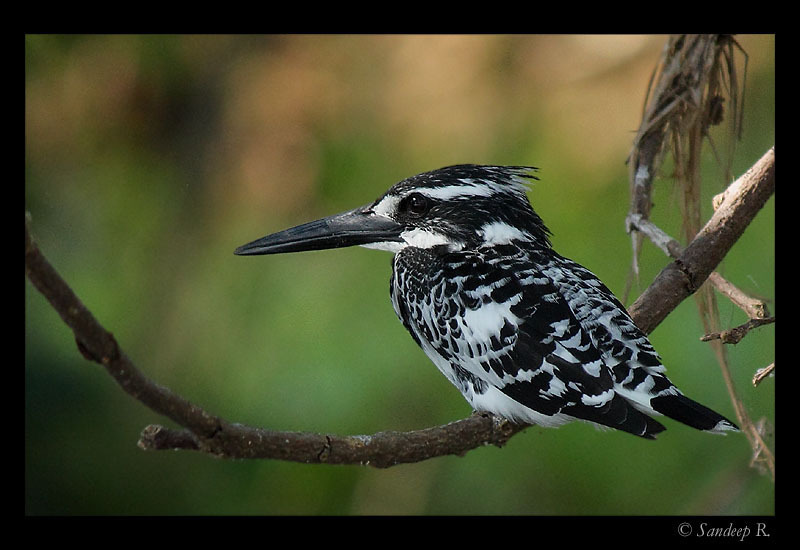 Previous evening, had met another guide, Ketan, from forest department who had fair knowledge on birds. So we wanted to take him instead. After about 2 hours, we got back to Reception. Ketan obliged to take us to show Frogmouths that he had sighted previous evening. Though I was not keen, I thought it’s better to see a frogmouth than not see nothing at all. He again took us into Karian Shola at a very brisk pace. Half an hour in, he looked around for roosting spot of Frogmouth, but there were none! It was disheartening. I had heard so much about Karian Shola, and it was a disappointment perhaps because of the weather. But we did see an Emerald Dove’s nest with a young one nestled in. Thankfully the light had picked up little bit. We took a few record shots and left the spot. After a good discussion with Ranger, he agreed to let Ketan go with us for the evening trek. Exhausted after a 4 and half hour trek without food, we left to our room. On the quick drive back to we saw Malabar Trogon, Brown Shrike and White Bellied Treepie. Had late breakfast at 1pm, rested for a while and drove back towards reception. 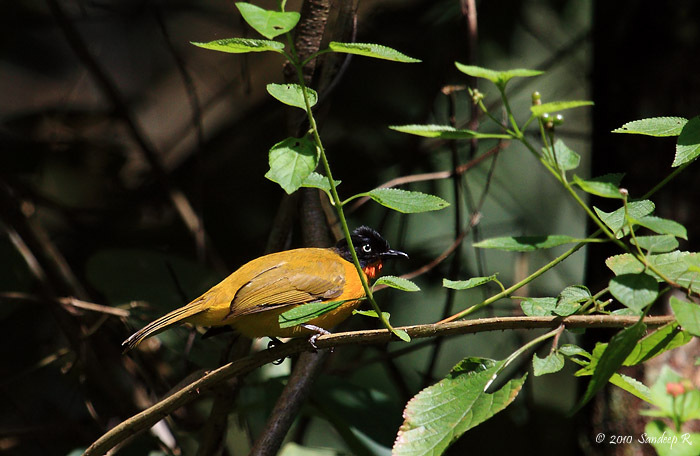 In this short drive again, we saw a mixed hunting party of birds – Wynaad Laughingthrush, Jungle Babblers, Rufous Treepie, White bellied Treepie, and the rare, bird of the trip, Chestnut Winged Cuckoo. A lone male Kestral was sighted in the open grass patch opposite reception. At the reception, we got Ketan and drove back towards Ambuli Illam for a trek. The bird activity was surprisingly low. However, we did see a Sloth Bear barely 15ft from us. Fortunately, the bear grunted and ran away. Late evening, we returned to the reception area and spent some time chatting with Natalie. It was surprising to see so many foreigners at Topslip. Few could not even speak English, and they were there in the remotest jungles, far far away from any metro city. ‘Nannari’, a local drink make from roots of some tree, is a must try. Vinay was so kicked that he picked up 3 bottles of it! By 8pm, we were asked to return to our room as an Elephants with a calf was sighted around there and would possibly cause trouble. The drive back in the night to Ambuli Illam to reception was fantastic with sighting of a Jungle cat, a Sambhar stag and a Doe, and many Gaurs. It’s incredible to drive at night without headlights in the jungle, only using a flash light to scan for glittering eyes staring at us. Next morning, we had decided we’d drive back to Bangalore without morning birding session as it would be futile with heavy mist. 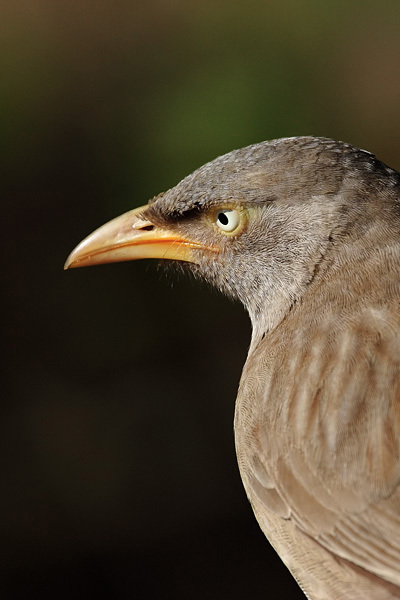 Driving back from Ambuli, we only saw few Jungle Babblers. We took an alternate route as we planned to stop over at Kgudi. The drive from Satyamangalam to Chamrajnagar is simply incredible. Ascending 27 hair pin bend in the midst of moist deciduous forest is fantastic experience. The only hitch is the heavy traffic of trucks and buses plying on this stretch. We saw nothing but bonnet macaques. 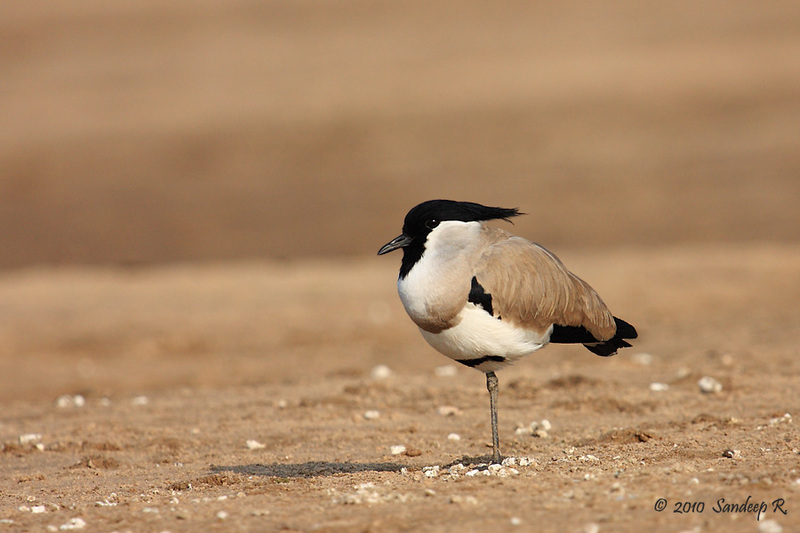 The bird activity at Kgudi JLR camp was surprisingly low. We saw a lone Verditer Flycatcher. It was good to catch up with Ashish at Kgudi JLR. Reached Bangalore by 9pm. A good enjoyable trip with great sightings and driving. Highlight of Birds: Wynaad Laughingthrush, Chestnut winged cuckoo, Malabar Trogon, Forest Wagtail, Malabar whistling thrush, Indian Scmitar Babbler, Emerald Dove, Pampadour Green Pigeon and White Bellied Treepie. Topslip is an excellent place for birding if the weather is good. Wynaad Laughingthrush (Garrulax delesserti) is not a common bird seen easily, and the fact that we were able to sight a flock twice without any guide shows how awesome Topslip is. There are many rooms or guest houses to stay at Topslip. Ambuli Illam without doubt is the best of the lot. It is better to have a vehicle if you choose Ambuli, for you have to drive back and forth reception for trek or visit to Elephant camp. Charge for 2 hour trekking is Rs. 500/-. Room charges are Rs. 1100/- per room plus Rs. 200 for reservation. Guide tips extra.